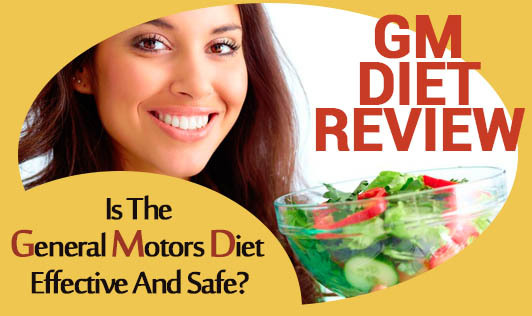 GM Diet Review – Is The General Motors Diet Effective And Safe? How does the General Motors diet plan Work? Rule #1 – You have to abstain from alcohol. Rule #2 – You need to drink 10-15 glasses of water each and every day. Rule #3 – You can supplement your 7 day diet with this GM soup: 28 oz, Water, 6 Large Onions, 2 Green Peppers, Whole Tomatoes (fresh or canned), 1 Head Cabbage, 1 Bunch Celery, 4 Envelopes Lipton Onion Soup Mix, Herbs and Flavoring as desired. This soup can be eaten as often as you like whenever you like. -Water (flavoured with lemon/lime if desired). -Plain Black Coffee. No cream or cream substitutes are allowed as are sugar or sweeteners. -Black Tea. Again, without sugar. -The fruit juices of day 7. No fruit juices before day 7. The Indian version of the GM diet is pretty close to the original. There are slight changes and they are described below. Day 1. All fruits. All kinds of fruit may be consumed except for bananas. 10-12 glasses of water should be consumed throughout the day. Day 2. All vegetables. All sorts of vegetables may be consumed during the second day. Potatoes may be served during breakfast to boost energy levels and needs some good fat like ghee or olive oil. A mixture of greens and boiled vegetables as well as the GM diet wonder soup may be served during lunch and dinner. Day 3. Mixture of fruits and vegetables. A mix of fruits and vegetables may be consumed on Day 3, together with 10-12 glasses of water. Bananas are still not allowed in this day. Day 4. Banana and milk. Skim milk and banana, together with the GM wonder soup or any type of vegetable soup may be served on this day. For Indian practitioners, yogurt may be served instead of skim milk. Day 5. Brown rice, curd and tomatoes. Soybean curd or 1 cup of brown rice may be used as a substitute for beef, or a cup of cottage cheese. Tomatoes are important to match with the day’s meal, along with cucumbers. Day 6. Brown/White rice and vegetables. On Day 6, brown/white rice or other beef substitute will be matched with vegetables, but potatoes are still restricted. It is best to consume cottage cheese and soybean curd in vegetable bowls. Day 7. Brown/White rice, vegetables and fruits. Two cups of brown/white rice may be consumed together with unlimited servings of vegetables and fruits. Fruit juice may also be taken along with 8-10 glasses of water. This is a free diet plan. Severely restricts your nutrition and may not give you all the nutrients your body needs to function. Is the GM Diet Safe and Recommended? The General Motors diet may look good on paper but it’s not recommended. This is a diet plan which restricts your food choices dramatically and may cause nutritional deficiencies and metabolic slowdown. While you may lose a few pounds during your week on the GM diet, this is likely to be mostly water weight. You will probably gain it all back quickly once you go back to eating your regular food. It’s not a lifestyle change eating plan and so it’s unlikely to be a long term solution.